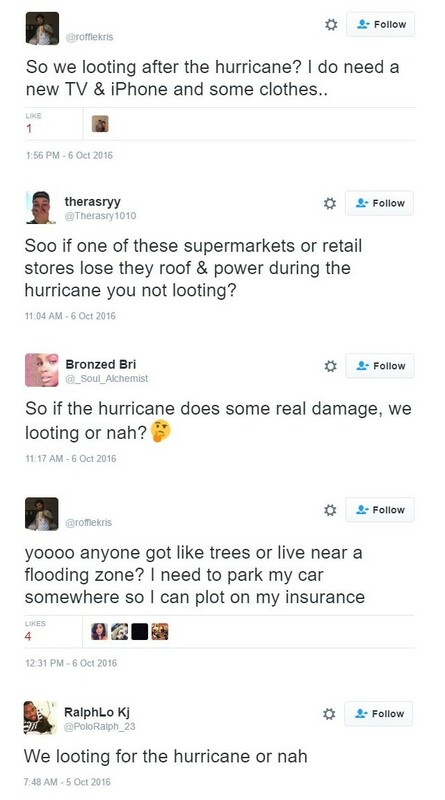 Black Lives Matter Activists Plan Looting Sprees As Soon As The Hurricane Hits! What is wrong with people? Seriously. 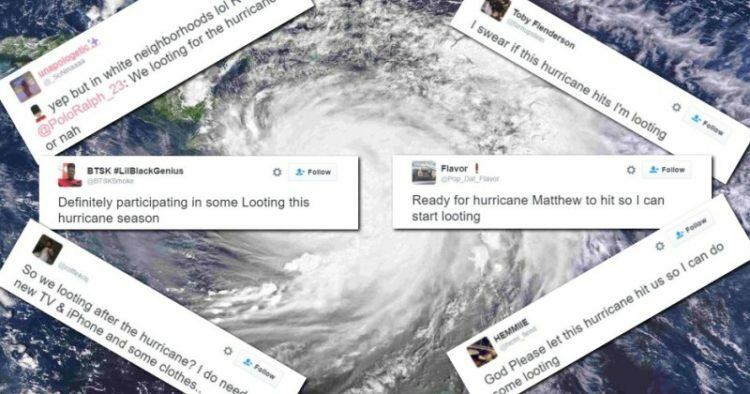 Black Lives Matter supporters were all over Twitter discussing how they were going looting when Hurricane Matthew hits. 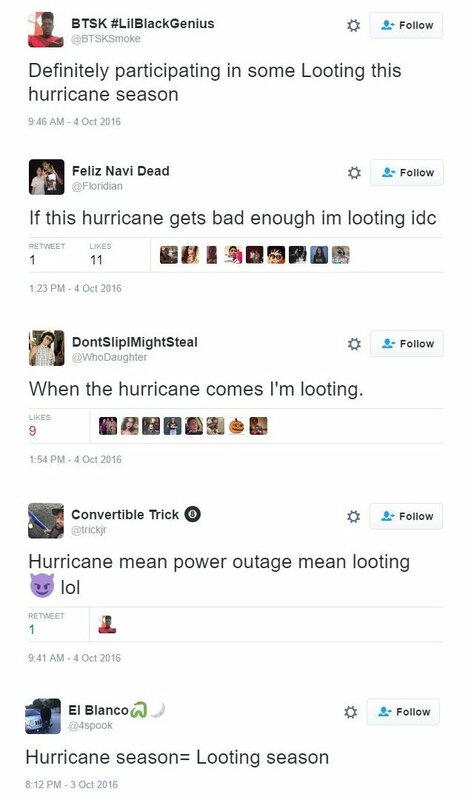 Talk about a dearth of morality… benefiting off of the misfortune of others… it’s called ‘looting and stealing’ and if I remember correctly, usually during an emergency, looters are likely to get shot. No great loss as far as I’m concerned. These dirt bags plan to target white neighborhoods so they can get TVs, iPhones and clothes. 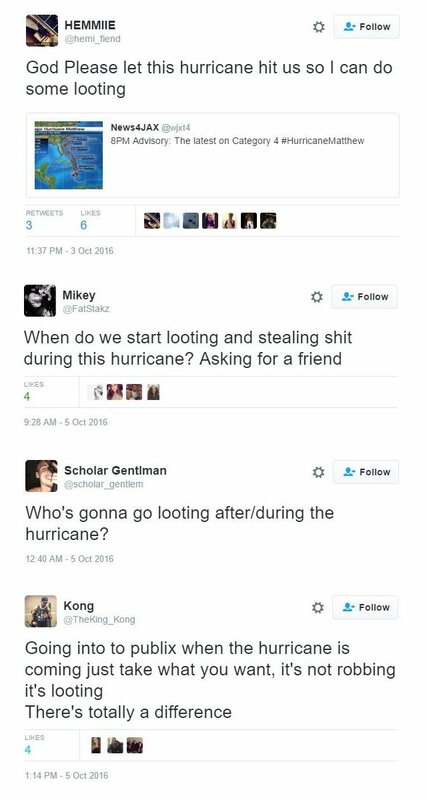 With any luck, the hurricane will get them and if not, either the police or citizens that are still hanging around will. People tell me that there are good people in the Black Lives Matter movement… I have seen very few if any. I actually believe there has to be something amiss with your moral compass for you to belong to that group in the first place. It is a terrorist group. And when you speak out against them, they are vile. You should see some of my emails. 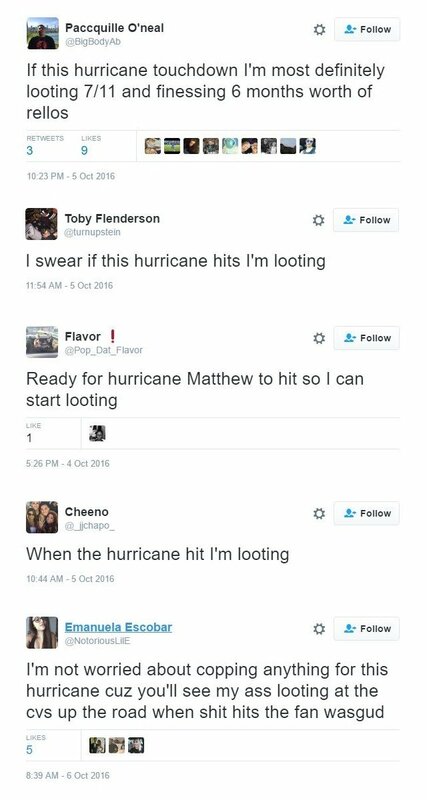 With Hurricane Matthew set to devastate the east coast, some people are preparing to callously exploit the mayhem by going on looting sprees. The extreme weather event is hours away from launching a “potentially catastrophic” Category 5 siege on Florida’s east coast before stretching into Georgia and South Carolina, but some are more concerned about how they can hijack the chaos to commit criminal acts. Many of these BLM thugs have used Black Lives Matter protests as an excuse to carry out mass lootings in Ferguson, Baltimore and most recently Charlotte. 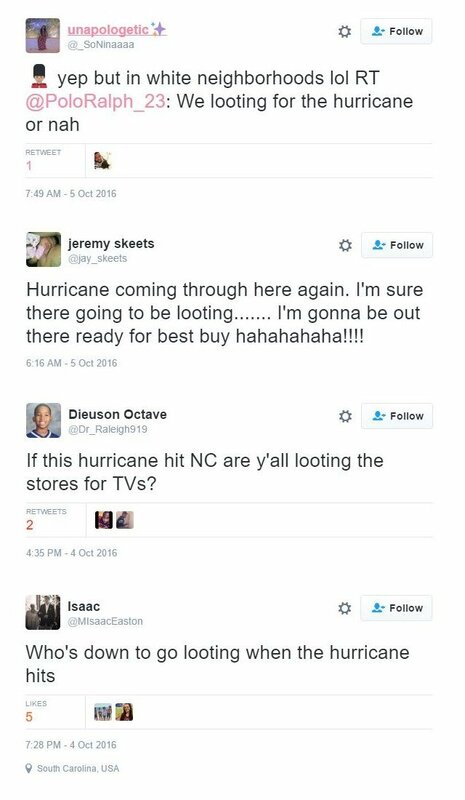 Now, they’ll caper up and down the east coast, looting to their heart’s content and leaving their mark as they go. 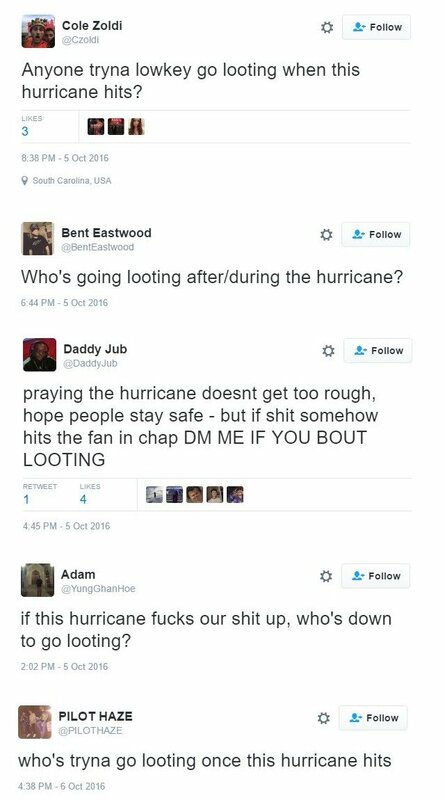 The hurricane will do their destructive work for them. These are the kind of people that would descend on Americans in a post-apocalyptic scenario. They are the lowest, most base subset that humanity has to offer. As of this morning, 300 or so are dead in Haiti from this storm. Cuba wasn’t hit as bad and there is no telling what the loss of life and cost will be in the US as Matthew bears down on us today. I pray that everyone comes out safe and sound. I also fervently hope that the leftists who plan on looting and committing other crimes are dealt with proportionately.